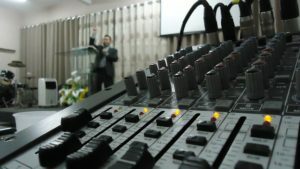 The PA and Audio Department provides all media solutions and technical supports for the smooth operation of the service every Sunday and each time the church meet for any occasion. The department consists of a team leader and workers that work as a unit to produce a godly inspired quality support for the church services and activities. We are responsible for the operation and maintenance of all media equipment such as: speakers, mixer desk, microphones and also other media systems such as I.T.equipment and projector. Our program scheudule normally starts on saturday, and involves setting up the P.A. system, and running a sound check with the choir. The whole Saturday activities normally take about 2 hours approximately. The day’s activities usually close with prayer dedicating our self and the equipment on to God for service on sunday. Anyone can work in the audio department; you don’t need any previous experience with any electronics or media equipment, all you need is a willing heart and dedication, and you will do great. You will have the opportunity to develop your knowledge in electronics, media production and I.T. You will experience warm friendly team bonding and fellowship, and you will have the chance to demonstrate your love for the Lord through the use of your gift and talent in the PA and Audio department. In terms of socilaising, we aim to meet on average once a month for a relaxing time to fellowship together. At times we go to the cinema or meet at each others houses or even with other departments to fellowship. May the Lord bless and keep you and reward your love of service for Him as you join the PA and Audio department in Jesus Name, Amen!